As an Emeritus Dean of MBA programs, I rejuvenated (never say retired) in December 2012. So when I rejuvenated, I took a poetry course, and another and another. And there I was, telling myself “Use your words, please.” And so I did, and I do. And always for fun! And if other folks enjoy my words, well that’s all the more fun. I live in a highrise, right smack dab in the middle of Boston. I enjoy getting up with the sun, making a hot pot of coffee, sitting with pen in hand and coffee cup nearby, thinking, writing and reading before the city wakes up. In addition to writing, I enjoy traveling (so many amazing places have become my muse), knitting, watching my children as parents, and sharing every day with the love of my life these past 49+ years. I started this blog March 1, 2015. Who says you can’t teach an old dame new tricks??? 🙂 I’ve met so many amazing people and find myself chatting with folks from all over the globe. I joined the board of dVerse, a virtual pub for poets, in May 2016. A wonderful site where poets from literally around the world respond to prompts on Mondays, Tuesdays and Thursdays. Cape Cod Muse in Provincetown Magazine, October 1, 2015 issue. 4 poems published at Poetry Breakfast: May 13, May 18 and May 31, 2016. Shadow published on One Sentence Poems, June 24, 2016. Tankas published in the Tanka Society of America’s Journals: Ripples in the Sand, 2016; and Ribbons, Fall 2017. Specs Assunder on One Sentence Poems, September 12, 2018. Farewell Provincetown in Provincetown Magazine, October 4, 2018. In March 2016, I was honored to read some of my poetry at Bermuda’s celebration of UNESCO World Poetry Day…and was invited to return in 2017 and 2018. 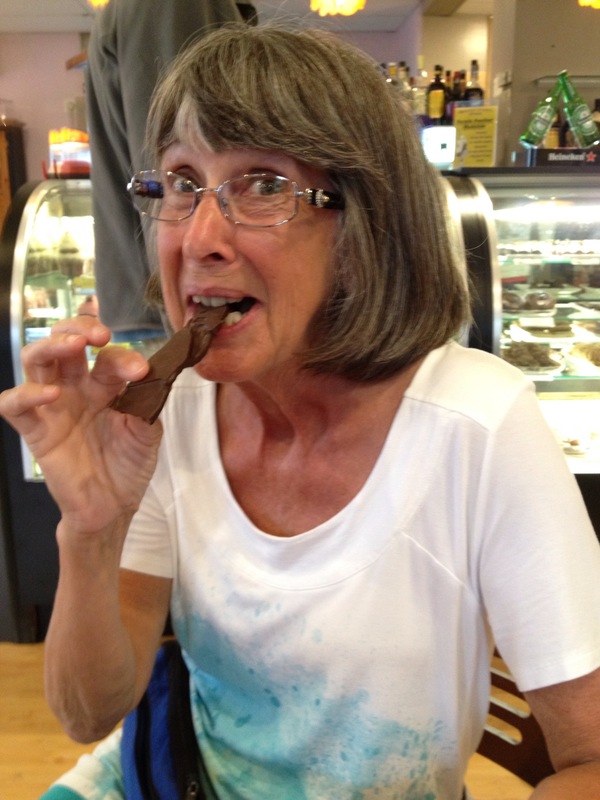 Lovin’ life — lovin’ sweets — game to try new things like chocolate bacon! And that’s me with the love of my life. We are thankful for every day! Thanks for visiting my blog and glad you enjoyed my post on Barbara Pym. I love your approach to retirement. I look forward to reading your work. As a recent re-discoverer of words (non-academic), it is encouraging to meet others like me! I have a premonition – your blog will be quite successful. So be ready for the positive maelstrom! Lovely meeting you. And again, thank you ever for stopping by my little blogcabin. Words really do get at the core. And you’ve managed to implant them firmly there, after a sojourn in the head and heart. Happy rejuvenatement! So glad you’ve stopped by….shall take a meander through your site tomorrow! Hope you’ll stop by again….truly fun to meander around this wordy world and find the creative muse in so many forms with so many from around the world! I so very much relate — it has taken me a long time to “re-find” things I had left on a shelf to come back to “later” — and I’m so very glad we have connected here on WordPress. Hello:) I must say, I am so glad I had this opportunity to page through your blog, I love the theme you’re using, it’s so easy to navigate from one post to another:) I cannot believe your blogging has began just a few months ago because you are so good:) your poetry it’s amazing, inspiring and full of beauty! I love all the categories you have, all the topics you write about! I am definitely following and I hope to see you visiting my red world again! Rejuvatement!! Love that. Wow! I’m inspired by your passion for life! So glad you stopped by. Yes — as I often say to friends who are having little quirks or frustrations in their day……”ah, the frustrations of life….and aren’t we glad we have them!” 🙂 Lovin’ life — it’s a gift! Read This is NOT Happening in my poems….and you’ll understand. 🙂 We are thankful for every day. Nicely said. Glad to meet you Lillian and thank you for visiting. Rebooting — another great way to put it. Thanks for stopping by and deciding to follow. Thanks for stopping by my blog. I love your outlook on life. I’m working my way towards my own ‘rejuvenatement’ next year, love that word. Isn’t this blog world quite amazing? Have only been doing this since March and have found it quite motivating and fun too! Your about page put a smile on my face. You have a wonderful approach to life – positive, enthusiastic and quite cheerful is what comes to my mind if I have to describe you based on your about page. Love your Blog page. I am a fan and your follower now 🙂 Look forward to reading your blog posts. Thanks for stopping by my blog. Hope my posts entertain and amuse you. Ah, so nice to see you here this morning over my first cup of coffee….I do enjoy my morning chats! Lillian, I found you by way of Melanie (This is my Corn), specifically your comment on her “Swing” story. I’ve enjoyed your poetry. Don’t want to lose you so I’m following. Come visit me sometime. oh my! Thank you soooo much 🙂 So you see, as I commented on your posts, we are both truly passionate about life! 🙂 Appreciate your kind words and wish you and your husband many years! Hi Lillian, thank you for visiting me and for your lovely comment. I’ve always been a bit shy about leaving comments but I am finding that the whole commenting thing is a wonderful experience. You have an absolutely great ‘about’ page! There is so much good in life and I think you have found it! My all-time favorite word for retirement is the Spanish “jubilación”. I think you are probably enjoying a fair amount of jubilation with your rejuvenatement. 🙂 And congratulations on the publication! I will remember that Spanish word! Perfect!! What a wonderful blog you have here. I can’t wait to read more of it. Happy Friday. Enjoy the weekend. So glad you’re enjoying my blog. I’m thrilled to find others who enjoy poetry! Also glad to have you with me on this journey. Thanks for following – hope to chat with you more over my morning coffee again! Thank you for sharing your wonderful energy! Rejuvenatement is a joy… And when there’s been a miracle in your midst in terms of health, we remember to be thankful for every day! So nice to meet you in this cyber space. hmmmm….thought I replied here! Have joined the dVerse group — such an interesting concept and a good group of folks! Happy New Year, Bjorn. See you at the pub again soon. with the way you right and capture the mundane things of life in your post, particularly the poetry, i am moved to believe that in 30 years from now regardless of your age then, it will keep getting better. i love this blog, even though new here, i must confess, your writings and wordings resonates in my heart for reasons i may not find it convenient to say for the sake of those eavesdropping. Thank you so much for taking the time to write a reply here. Very happy you enjoy my posts. Hope to see you again throughout the new year! Wonderful to “meet” you, Lillian. Like you, I chose not to retire (from nursing) but to begin anew the creative life–from death and dying to birthing. The flower is a photo my husband took in our Reno backyard…it became the cover photo of my first novel. Thank you…it would be nice to chat more often. I hang out at dVerse a lot. I am pleased to meet you, Lillian. I look forward to reading more of your posts. My fortune cookie fortune said: Today smile at everyone you meet. 🙂 So glad to meet you even further. And so glad to read what you wrote to my sister of the soul, Victoria. We think we are both reincarnated Japanese – she thinks she was a court lady, I know I was a Samurai, lol. Perhaps you were an empress. Who knows? How lovely! And thank you for stopping by my blog to read some of my FF stories! I’m glad to make your acquaintance, and look forward to reading your posts! I found your blog because of NaPoWriMo. Your CV is a bit overwhelming (in a good way!). I’m only 23, but all the recently retired people I’ve known would definitely fit in with your “rejuvenated” lifestyle. I think, for many people, the best parts of their lives start after retirement. Also, the book spine poem was a cool prompt! ooooh — didn’t need to be overwhelming. I’d just adjusted the About section…will need to go back and underwhelm it a bit 🙂 Glad you found me — will be nice to chat over my morning coffee with you. I loved my life before rejuvenatement — no regrets. But I do enjoy my Sunday evenings more now 🙂 and when one decides, there is no boredom in life! 🙂 Hope to see you again! and glad you liked the book spine prompt. Wow! I am inspired by your story. Good for you to start a new adventure! I agree although I find it hard sometimes to leave behind memories & relics of my past. I am struggling a bit this week with giving my sons more of their Dad’s things. It is the right thing to do but painful. They are just “things” but they signal letting go and moving on. Well….except they are not just “things” or you would not think it was meaningful to give them to your sons. You are sharing their dad’s love with them in a concrete way — and you still have his love in your heart and in many other belongings that you keep — because they belong where they are. Love is meant to be given away — and to cherish within as well. Thinking of you…..
Rejuvenatement! So that’s what I’m doing. Had to retire last year due to health issues but am now writing most of the time and crafting my art as well. Found you on Gayle’s site. So nice to meet you! Yes – my spouse is similar to you in terms of how he came to his rejuvenatement period. This aging thing as my aunt used to say “is not for sissies!” But – I’ll take it any day in comparison to the alternative! It’s all about juxtapositioning, right? How we choose to juxtaposition ourselves to people, places, events, challenges. Here’s to successful and fun juxtapositioning! So fun to read your reply here! I do love seafood also — Boston is a great place for seafood as is the Cape. For me, Tazo chocolate is a delicious treat — dark chocolate my favorite. Will definitely have to visit your blogs — so glad to meet you here, Lea! Enchanté Lillian! Actually, I lived in NYC for about six years back in the dark ages… a few of the long stories if I ever get the book out there? I was born in CA to immigrant parents (UK and Swede) so I know a wee bit about good seafood. I’m afraid I’m not familiar with Tazo chocolate? I’m thrilled to have you check out my blogs and hope you will stop by some time and chat! What a great Mom you were (“Use your words, please!”) How perfect. So nice to meet you here! Hope you’ll stop by again. And yes….I do enjoy the 1-sentence format. It’s really a challenge to infuse the meaning into so few words! Hi Lillian! Lovely site. Could you contact me please so that you can put photo credit on one of my photos that you are using? Thank you! Oh dear. Sincere apologies. I try to be so careful about giving photo credits. I am so sorry. Can you please just tell me the name and date of the poem, and the statement you’d like in the photo credit and I’ll be happy to do that. Alternatively, if you’d rather I not use the photo, I can take it down and find another. Again, I do apologize. If you look through the site you’ll find that I do give photo credit unless it’s mine, or I find it in a public domain place. I am so sorry. Let me know. My hubby and I just went there this year. Actually, if it’s the photo I’m thinking of, it’s in Bermuda. We were there all of Feb 2015, all of Feb and March 2016, and will be there Jan 28 to Feb 28 this year. Looks like the opening to Penn’s Cave. Supposedly the only water cavern tour in (the county, state, country?). We’re sort of neighbors ( I think…when you aren’t in Bermuda…I’m in SW, PA. The photo and the 48 years – an inspiration!